When the International Boxing Hall of Fame prepared the ballots to send to electors last year, there were so many quality candidates eligible to be added for the first time that instead of including only three new names -- the norm -- to replace the three that are elected annually in the modern boxer category, five names were added to expand the ballot from 30 to 32 former fighters. The Hall of Fame did not have that issue this year, reverting to the usual three new names being added to the ballot with none considered a lock -- as there is in most years. Appearing on the ballot for the first time are former bantamweight and junior featherweight world champion Rafael Marquez, former featherweight world titlist Chris John and former four-time super middleweight world titleholder Mikkel Kessler. They appear on the ballot in the modern category, which is for fighters whose last bout was no earlier than 1989. To be eligible, fighters must not have boxed for at least five years. Full members of the Boxing Writers Association of America and a panel of international boxing historians have an Oct. 31 deadline to return their ballots to the Hall of Fame, which will announce the results in December. 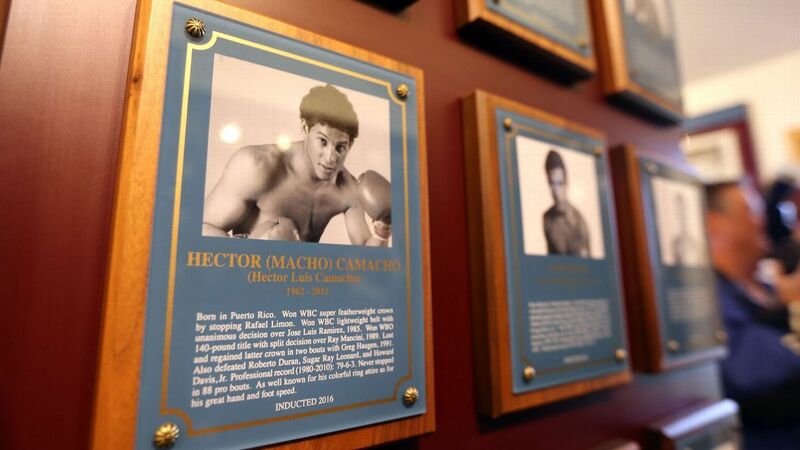 Voters can select up to five fighters but only three will be elected, with the 30th annual induction ceremonies scheduled to take place on June 9 at the Canastota, New York, shrine. Mexico's Marquez (41-9, 37 KOs), the younger brother of shoe-in Hall of Famer Juan Manuel Marquez, who will be eligible for the ballot next year, appears to have the strongest case for election among this year's trio. He boxed from 1995 to 2013 and though he lost his professional debut, he went on to have a dominant bantamweight title reign from 2003 to 2007 and later engaged in an epic four-fight series with Israel Vazquez that produced two fights of the year. He was also 8-6 against titleholders and Hall of Famers. Even before Marquez won his first world title he scored two major victories against Hall of Famer Mark "Too Sharp" Johnson, winning a split decision against him in their first fight in 2001 and then knocking him out in the eighth round of their immediate rematch in 2002. In 2003, Marquez knocked out then-undefeated and long-reigning bantamweight titleholder Tim Austin in the eighth round and made seven defenses against opponents such as former titlist Mauricio Pastrana, Heriberto Ruiz and two against then-unbeaten Silence Mabuza. Marquez moved up to junior featherweight in 2007 and knocked out Vazquez in the seventh round to win a junior featherweight title in an epic battle. They fought three consecutive fights against each other in memorable events. Vazquez exacted revenge to regain the title in the second fight when he stopped Marquez in the sixth round and then Vazquez won a split decision to retain the title in the third fight in 2008. The second and third fights were both the ESPN.com fights of the year for 2007 and 2008 and the only reason the first fight didn't win was because it was in the same year as the second fight. Marquez finished the series by knocking out the faded Vazquez in the third round to even the series at 2-2 in 2010. It was his last notable victory before closing his career by going 2-4 in his final six bouts, including unsuccessful challenges for featherweight and junior featherweight world titles. Kessler (46-3, 35 KOs), the "Viking Warrior," who boxed from 1998 to 2013 and is considered by many to be the best professional boxer to come out of Denmark, won versions of the super middleweight world title four times and was 7-3 against titleholders and Hall of Famers. He won his first belt by stopping Manny Siaca in the seventh round in 2004 and defended it four times, a reign in which he defeated former titleholders Anthony Mundine (on the road in Australia) and Eric Lucas, Markus Beyer in a unification fight and top contender Librado Andrade. Then he met fellow titleholder Joe Calzaghe in Wales for 168-pound supremacy in a unification fight before more than 50,000 in 2007. It was one of the biggest fights in division history and Kessler lost a clear decision. He would go on to win another title, but in his first bout of the Super Six World Boxing Classic -- a six-man round-robin tournament involving the best of the division -- he was schooled by Andre Ward in an 11th-round technical decision loss in 2009. In his next fight, he scored a huge win by outpointing Carl Froch to win another title in 2010. He then withdrew from the tournament because of an eye injury. He eventually returned to win three fights in a row, including claiming a secondary title, before losing a decision to Froch in a 2013 rematch for a world title, after which he retired. John (48-1-3, 22 KOs), known as "The Dragon," boxed from 1998 to 2013 and became a national hero in his home country of Indonesia. He held a featherweight world title from 2004 to 2013 and made 18 title defenses, though he was only 3-1 against titleholders or Hall of Famers. During his long reign his most notable victories came against Juan Manuel Marquez, Derrick Gainer and Rocky Juarez before he was dethroned by Simpiwe Vetyeka in a sixth-round knockout in his final fight. The holdovers on the 32-man modern ballot are Yuri Arbachakov, Paulie Ayala, Nigel Benn, Ivan "Iron Boy" Calderon, Sot Chitalada, Donald Curry, Chris Eubank Sr., Leo Gamez, Ricky Hatton, Genaro Hernandez, Julian Jackson, Santos Laciar, Rocky Lockridge, Miguel "Happy" Lora, James "Buddy" McGirt, Henry Maske, Darius Michalczewski, Sung-Kil Moon, Michael Moorer, Orzubek "Gussie" Nazarov, Sven Ottke, Vinny Pazienza, Gilberto Roman, Gianfranco Rosi, Samuel Serrano, Meldrick Taylor, Fernando Vargas, Wilfredo Vazquez Sr. and Ratanapol Sor Vorapin. There will also be two candidates elected in the observer category, with longtime ESPN analyst Teddy Atlas the most notable of the newcomers on the 30-person ballot; three will be elected in the non-participant category, with legendary Top Rank publicist Lee Samuels and famed promoter Don Elbaum the most notable of the newcomers to that 35-person ballot; and one will be elected from the 40-man old-timer ballot, which is for fighters whose last fight was no earlier than 1943 and no later than 1988.